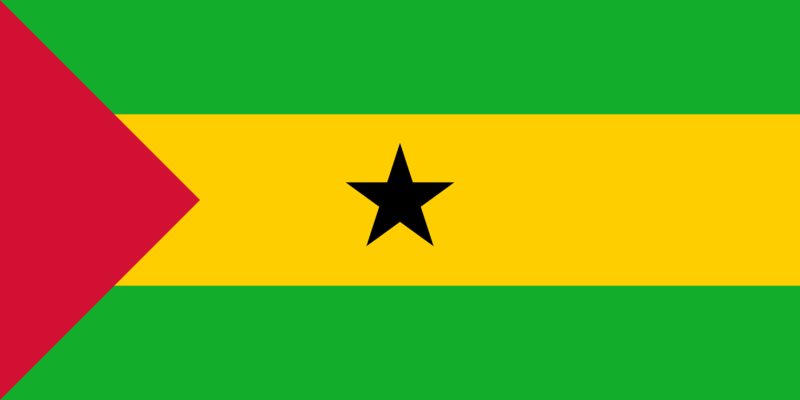 The flag of Tomé and Principle consists of a red triangle situated at the hoist, with three horizontal green, yellow and green bands charged with two five-pointed black stars at the centre. Adopted in 1975 to replace the flag of Portugal from the colonial period, it has been the flag of the Democratic Republic of São Tomé and Principe since the country gained independence in that same year. The design of the present flag was inspired by and is almost identical to the flag of the Movement for the Liberation of São Tomé and Principe.